… aka my husband and I. It seems I had an even more tragic childhood than I imagined as I did not see even one episode of The Muppets. I had thought I was too old for them, but my dear husband tells me I’m not! When he suggested on the phone today that he was Beaker, I was completely clueless, hence the link to the lesson about The Muppets. 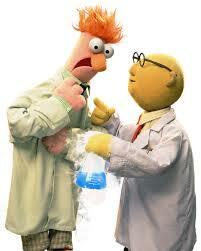 I had been struggling today with a ‘Tuesday humour’ blog, so Beaker and Dr Honeydew might just have to be it. When I turned 40, I felt my body was ‘oh so slowly’ catching up to the age inside my head, and then when I turned 50, I was almost there. I grew up in a rural community, and spent a lot of time with my grandparents and a great aunt, which influenced me greatly. My taste in music, television, movies and clothing was closer to someone 20-40 years older than me, until the last few years, when one girlfriend rightly declared, I am getting younger! I watched it a little, I think, but of course I remember nothing about it. But I think that you’re Kermit the Frog – because I think he was the leader, the Muppet that was directing everything …… ask hubby and if this is right, then YOU are Kermit the Frog. And watch this ……. this song played a large part of my life about 2 years after diagnosis while I was doing relaxation sessions …. terrible YouTube clip, but the song is what I loved…..
How funny… Kermit the frog!! Not sure whether it is Action Barbie, Dr Honeydew or Kermit the Frog??? Hello, FYI more than you probably need to know about Dr.Bunsen Honeydew and Mr. Beaker. This info is from wikipedia. If the shoe fits wear it, knowing that you can always change shoes whenever it seems appropriate. Dr. Bunsen Honeydew is the resident scientist on The Muppet Show, and the host of the Muppet Labs sketches. In season one of The Muppet Show he worked alone, but in season two, his assistant Beaker was added to the show. Bunsen is always eager to show off his latest scientific discovery, but his excitement about progress tends to render him short-sighted. Beaker usually ends up being harmed by Dr. Honeydew’s inventions. Bunsen Honeydew’s name comes from the scientific instrument called the Bunsen burner, and the shape of his head, which looks like a honeydew melon. Bunsen’s inventions have included a gorilla detector, exploding clothes, edible paper clips, a banana sharpener, hair-growing tonic, and a machine that can turn gold into cottage cheese. He has appeared in every Muppet movie, often with a large role contributing to the film’s plot. In The Muppet Movie, Kermit the Frog meets Bunsen and Beaker in an old ghost town, where Honeydew shows off his latest invention, “Insta-Grow Pills,” which can temporarily make things grow bigger. In The Muppet Christmas Carol, Bunsen and Beaker portray charity workers. In Muppets from Space, Bunsen invents a number of devices for the Muppets to use when they rescue Gonzo. Bunsen’s birthday is on the 20th of some month. In the Muppet Babies episode “Muppetland,” Bunsen invites Kermit to his birthday which is to take place “in two weeks.” Kermit circles Saturday the 20th on the calendar in a month with 31 days. This episode aired in 1987 and no months match the calendar seen. In a 2004 Internet poll sponsored by the BBC and the British Association for the Advancement of Science, Beaker and Dr. Bunsen Honeydew were voted Britain’s favorite cinematic scientists. They beat Star Trek’s Mr. Spock, their closest rival, by a margin of 2 to 1 and won 33 percent of the 43,000 votes cast. Beaker is a Muppet character from The Muppet Show. He is the shy, long-suffering assistant of Dr. Bunsen Honeydew, and is likewise named after a piece of laboratory equipment. During the first season of The Muppet Show, Bunsen Honeydew presented the Muppet Labs segments by himself; Beaker was added as his lab assistant from the second season on. Beaker has bulging eyes, a shock of red hair, and a drawbridge mouth. He was originally puppeteered and voiced by Richard Hunt until Hunt’s death in 1992, when the role was taken over primarily by Steve Whitmire. Beaker is a magnet for misfortune; his appearances typically involve him being blown up, electrocuted, eaten by large monsters, or losing body parts. Beaker communicates in a nervous, high-pitched squeak that sounds like “Mee-mee-mee mee”. In books and merchandise, the sound is spelled “Meep”. In The Muppet Movie he appeared to say something other than “mee” or “meep” (he “meeps” Honeydew’s previous line “sadly temporary”). His tone or expression helps to communicate his meaning. “Meep” and “mee” are pronounced to rhyme with “beep” and “bee”, respectively. The two scientists were later incorporated into the Muppet Babies animated series. Howie Mandel (during early seasons) and Dave Coulier voiced Bunsen, and Frank Welker provided Beaker’s squeaky meeps. Beaker was performed by Kevin Clash in The Muppet Show Live. An animated Beaker was also voiced by Richard Hunt, his usual performer during that period, when he appeared in the short lived Little Muppet Monsters series. Ode to Joy is the common term used to refer to the fourth and final movement of Ludwig van Beethoven’s 9th Symphony. In choral performance, the piece used the text from the poem An die Freude (Ode to Joy). Beaker performed the movement in an online video. To be more specific, six Beakers perform the number: one on violin, one on timpani, one keeping time with the metronome, and three vocalists, all replacing the lyrics with extended “Meemeee”-ing. Inevitably, disaster ensues. The video was nominated in the Music category of the 2009 Webby Awards, as well as the ‘People’s Voice’ award. Beaker won the Webby Award, and accepted the award at the June 8th ceremony. This song is used for episode 209 of Muppets Tonight during the montage of “Greatest Hits” on the show. An upbeat version of the song is used as chase music at the end of a Monsterpiece Theater segment, Conservations with My Father.